Diamond technology, says Uzi Levami, the CEO of Sarine, Israel's leading diamond technology firm, has been and continues to be a major component that contributes to the success of Israel's diamond industry and trade. It is also the reason Sarine continues to support the International Diamond Week in Israel, a unique biannual diamond trading platform that is now it is third year. One of the accompanying and recurring events during the Winter Edition of the International Diamond Week in Israel (IDWI) is the DiamondTech Exhibition where Israeli diamond technology firms display their latest inventions and technological solutions that help diamond companies not only produce better and more desirable polished diamonds, but also provide marketing tools that help diamonds traders market their stones more effectively and profitably. 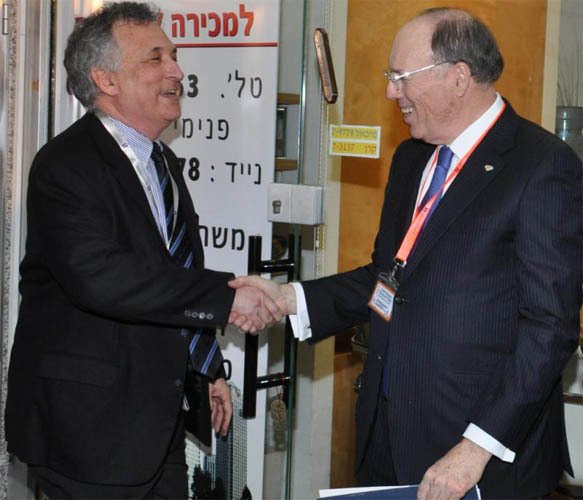 In February, the DiamTech exhibit will be opened by Israeli Nobel Prize Winner Prof. Dan Shechtman. "While our company is listed on the Singapore Stock Exchange, Sarine is a proud Israeli firm that in the early 80s almost single handedly married the high tech industry to the traditional diamond manufacturing industry and trade," Levami noted. "Since those days, we have come a long way and have evolved into a marketleaderin the provision of technological solutions for the diamond and gemstone industries, with innovative and advanced products and services for the benefit of the entire industry, from mine to consumers." In February, Sarine, a regular and highly appreciated IDWI sponsor, will be exhibiting the company's latest advances to the IDWI participants. It will be joined by a handful of additional high tech firms that provide services to the industry. "The competitive environment of our market niche and the drive to always try and anticipate the market needs, rather than respond to them, have made Sarine the success we are," Levami stated. "The International Diamond Week in Israel is a great environment to demonstrate our latest developments and devices," Levami continued. "The competitive environment of our market niche and the drive to always try and anticipate the market needs, rather than respond to them, have made us the success we are. The International Diamond Week in Israel is the response of the Israel Diamond Exchange to this environment of competition and the continuously changing market challenges. And we are glad to take part in it, and do our part in propelling the Israeli diamond sector forward, " Lev Ami stated.